When Captain Henry Osborne was commissioned as governor of Newfoundland in 1729, it inaugurated a form of local government that remained basically intact well into the 19th century. It also marked a departure from the proprietary system of the 17th century: for the first time, the island's governor was a servant of the crown appointed by writ of the privy council. Whereas the early governors had been leaders of commercial ventures, the naval governors were professionals, paid a set salary, and given an official mandate to enforce the authority of the Crown. The British government built upon existing infrastructure and traditions, since the naval detachment sent annually to protect the fishing fleet had long been active in the local administration of law. 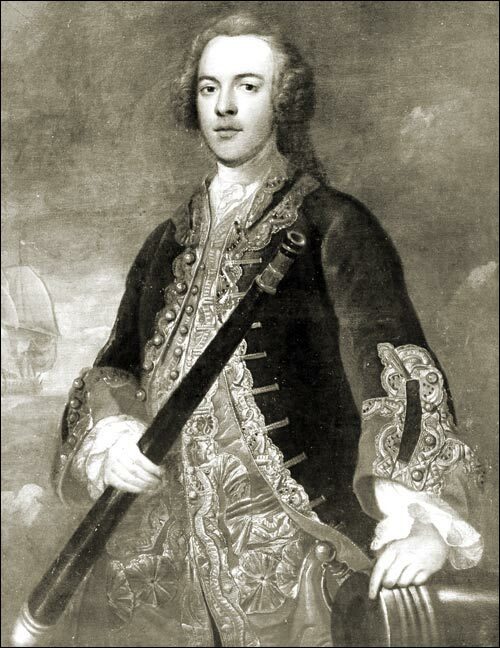 By King William's Act of 1699, naval commanders were empowered to act as appeal judges in cases heard by fishing admirals, and senior officers had at times assumed the position of de facto governor. 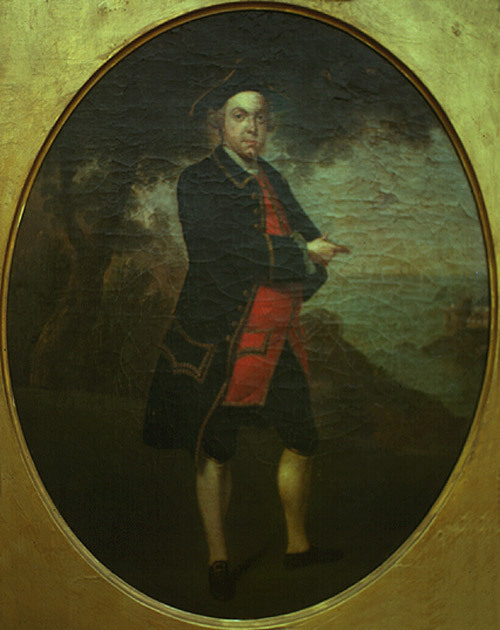 Arthur Holdsworth was the fishing admiral of St. John's harbour in 1700. The son of a vicar, Holdsworth was born in Dartmouth, England in 1668. He was one of five sons, most of whom were prominent in the Newfoundland fishery. Holdsworth died in 1726 while mayor of Dartmouth. Reproduced by permission of Gordon Handcock © 1987. Original in the possession of Cmdr. Holdsworth, Holbeam Mill, East Ogwell, Devon. It is important to note that the governorship was first and foremost a post in the Royal Navy. From 1729 to 1825 every governor was simultaneously the commander-in-chief of the Newfoundland station. Prior to the appointment of Admiral John Montagu in 1776, all of the naval governors were commodores. The position of commodore was a temporary rank given to an experienced post-captain when he assumed command of a naval squadron or station. Valued by aspiring officers as a means of securing future promotion, it brought the coveted honour of hoisting a broad pendant and included a wide range of responsibilities. The commodore of the Newfoundland station had to manage the squadron, which typically included several warships as well as his own flagship, and follow orders from both the British Admiralty and the Board of Trade. Throughout the 18th century, Britain was almost continually at war and the commodore had the difficult task of containing French forces in the region. With the outbreak of the American Revolutionary War, the Admiralty strengthened the Newfoundland squadron substantially, and after 1775 nearly every governor was an admiral in the British fleet. This view is towards the southwest. In the background is the admiral's flagship. Although not clearly visible in this image, a close inspection of the painting shows the admiral's broad pennant hoisted from the stern. Watercolour possibly by Nicholas Pocock. Courtesy of Library and Archives Canada, Acc. No. 1996-381. The legal basis of this system was the commission given to each governor at the beginning of his term. It empowered the officer to act as governor and commander-in-chief over all of the civil and military personnel within his jurisdiction, authorized him to appoint local magistrates, and gave him the honorific title of "Excellency." Issued only once to each governor, who usually served a three-year term, the commission was not an act of parliament but, rather, a prerogative writ of the Crown. In the 1730s several fishing admirals challenged the governor's authority by arguing that this commission was inferior to statute law; but by 1750 the naval governors had become firmly entrenched as the unrivaled political and legal force in Newfoundland. Governors had many responsibilities to discharge during the months their squadron visited Newfoundland. They were normally resident at St. John's from July or August to late October or early November. 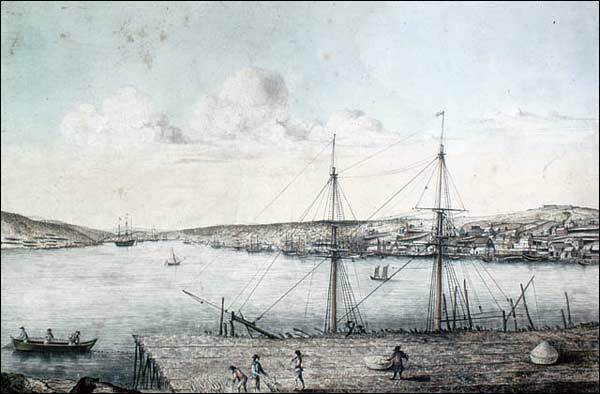 Local government was in many ways seasonal, though the justices of the peace held sessions throughout the winter and, after 1775, some naval officers were stationed on the island year-round. Each year the governors presided over a series of ceremonies that marked the familiar rhythm of public life. When they arrived each summer, the fort on Signal Hill boomed out a salute and the flagship moored near the centre of St. John's harbour. The governor, followed by the other offices, proceeded in his launch to the King's Wharf, where he was received by the senior magistrates, the prominent local citizens, and an honour guard from the garrison. His commission was publicly read, the oaths of allegiance were administered, and the governor quickly got down to work. 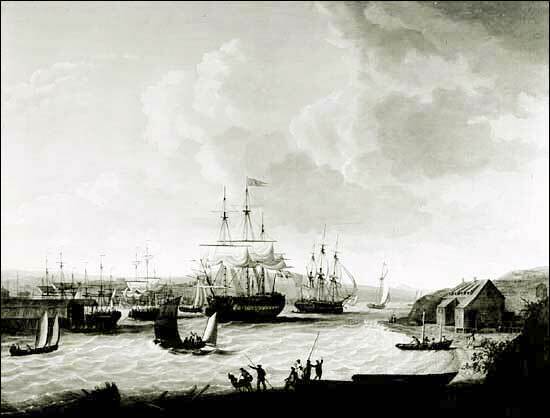 He dispatched his junior officers on cruises to the outport districts, where they convened surrogate courts; he corresponded and met with merchants to discuss the state of the fishery and the price of fish; and he carried out the many official instructions included in the Heads of Inquiry drawn up by the Board of Trade, which included the annual compilation of the statistical returns of the fishery. This view is towards the northeast. Courtesy of The Rooms Provincial Archives Division (B7-190), St. John's, NL. Original painting in the possession of the Lundrigan family. After 1750 the governor oversaw the operation of the Assize Court,, which sat each year in September or October, and he personally considered the cases of offenders sentenced to death. Once these legal duties were completed, the governor worked to ensure that the various convoys of merchant ships and naval escorts were properly assembled. After the voyage back to England, which usually took several weeks, he reported to the Admiralty and the Secretary of State, who expected a full account of any major developments. During the winter months, the governor normally resided at his private residence, but he still continued to conduct official business, meeting regularly with government ministers and merchants concerned with the Newfoundland trade. In the spring he readied his squadron for the Atlantic crossing, which could entail protracted squabbles with contractors over provisions, and the flagship was often peppered with letters right up to the day it sailed. Naval governors were actively involved in almost every aspect of political and legal administration in Newfoundland. The justices of the peace and the other civil magistrates took their orders directly from the governor. Relying on clerks and, after 1779, the civil secretary, governors kept a close watch on the magistracy and seldom hesitated to dismiss justices who acted improperly. They presided over a small administration -- for most of the 18th century, the entire budget totaled less than £2,000 -- but few colonial governments enjoyed a large bureaucracy in this period. The amount of official business conducted each year rivals the workload of many modern public officials. This of course depended in large measure upon the governor's individual initiative: some officers, such as Captain Hugh Palliser, were extremely vigorous administrators, while others did the bare minimum required of them. In addition to their other legal duties, from 1749 to 1780 most governors sat on the bench as judges. In sessions similar to the courts of Chancery held in other colonies, they convened a "Governor's Court" which determined a wide variety of civil causes. Through the use of proclamations, they exercised tremendous discretion over the implementation of policies on issues such as religion. For example, while Governor John Campbell issued an edict of toleration in 1784, thereby legally permitting Roman Catholics to worship publicly, Governor Mark Milbanke tried to restrict this policy after taking office in 1789. Campbell (1720-1790) served as Governor and Commander-in-Chief in Newfoundland from 1782 to 1786. Courtesy of The Rooms Provincial Archives Division (VA27-23), St. John's, NL. Naval governors dominated local government in a manner never seen before or since in our history. They had remarkably broad powers and contended with neither an independent press nor a legislative assembly. Governors could be authoritarian, but they never became the type of tyrants popularly associated with undemocratic institutions. The limited infrastructure inhibited governors' abilities to act unilaterally and encouraged them to cooperate with magistrates and merchants. They had no vested economic or political interests to protect locally, aside from their naval squadron, and were comparatively free of the bitter parochial politics that plagued many colonial regimes. Since their appointments were usually limited to three years -- after 1818 they resided at St. John's year-round -- they rarely embarked on ambitious administrative projects. Accountability to London tempered their political autonomy, and governors remained subject to the professional constraints imposed by the Admiralty. From the perspective of English merchants and officials, naval government functioned relatively well, cost comparatively little, and caused few political problems. But in the 1820s it came under heavy attack from local reformers who criticized the governors for being the unelected rulers of an unfair political system. With the rise of a political movement demanding representative government, the governors' time had passed, but they left an indelible mark on our history. By the time the British government established a new constitution and appointed a civil governor in 1825, naval governors had dominated Newfoundland for nearly a century.